Geoff and Heidi Preston reported catching an 11.2kg snapper a couple of weeks ago so Rob Nelson and I went down to Mokau this week to see how they do it. We arrived at Mokau on Wednesday evening and had a great dinner at Geoff and Heidi's before settling in to the Mokau Motel. It took around two minutes to get to Mokau Beach from the Motel and we arrived right on daybreak, the surf was low and a bitterly cold fog streamed out from the Mokau and Awakino River valleys. 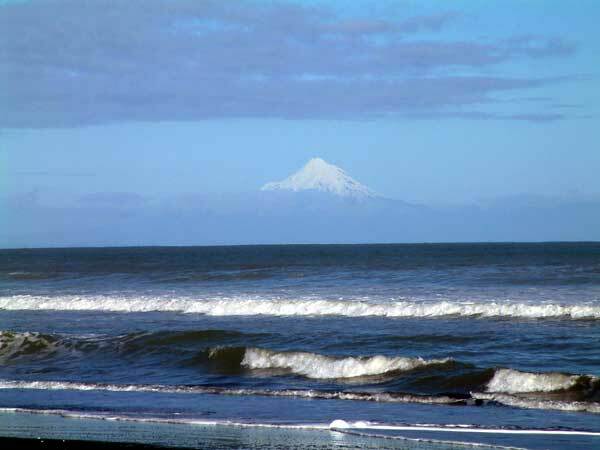 Just above the fog a snow capped Mount Egmont dominated the horizon. We set up a 65kg Dropper Rig around 300 metres north of the Mokau river mouth. It was so cold my freezing fingers had difficulty with the kite clip and Robs were so numb he stuck a hook into his finger while baiting up without even feeling it! We quickly determined that the marginally light offshore easterly wind flow had a ceiling of around 50 feet - above that a southerly would blow the kite back onshore. We decided to attach the dropline on the dropper rig to the loop on the bottom of the skyhook shock cord, this gave us a kiteline length of about 6 metres. We also cut the length of the drop-line down to 10 metres. This resulted in the kite being flown at 10 to 15 metres above sea level. We were in an awkward spot with a headland behind us and the 6 to 10 knot wind was deflecting up the beach because of this. Our Mega Mouth kite pulled well in the gusts but stalled in the turbulence caused by the wind shadow of the headland. We decided a running shot to the north might get the gear out, but were defeated by the fact that the further away we got from the river the weaker the wind became. Finally, with the gear between 300 and 400 metres out we left it to fish. 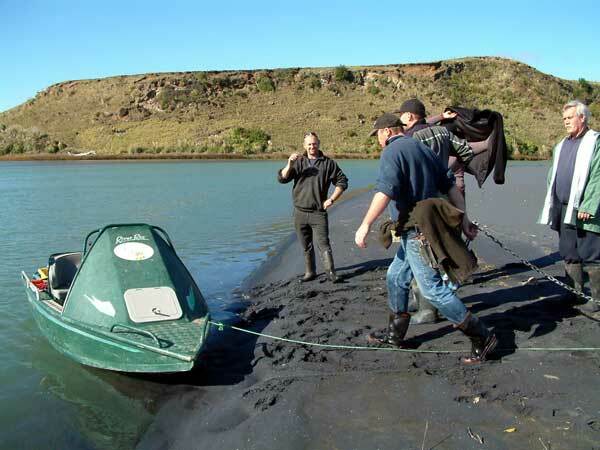 The nearshore water was still very muddy so we weren't surprised that we caught nothing on the set. Just as we had finished hauling, Geoff Preston arrived an said they had just got two longlines out 700 and 800 metres offshore, both rigs were powered by Mega Mouth Kites and were flying at 12 meters above sea level. He suggested we head back to his place and have a coffee and fresh baked muffins while the rigs fished for a couple of hours. After breakfast we all headed back to the beach to haul the two rigs in. 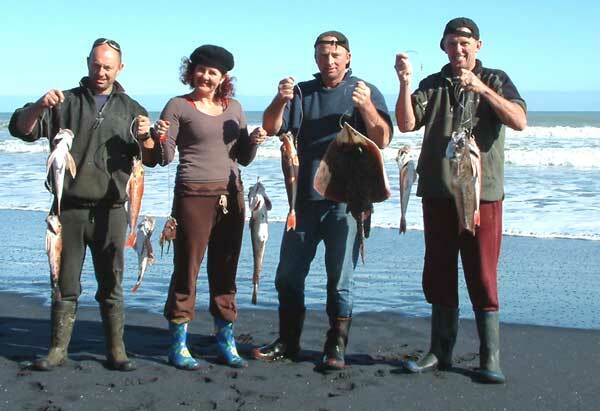 Geoff Preston, Jeff Litton and Steve McEwen fished north of the Awakino River. This requires crossing the river and Jeff had a jet boat on hand for this purpose. The advantage of this spot is the Awakino River is wider at the mouth and runs parallel to the beach for some distance before discharging into the sea. The resulting spit, which is only 100 meters or so wide and 10 metres high, has a gap in it about a mile north of the Awakino Heads. This topography results in the best wind in the Mokau - Awakino area, the wide valley discharges three or four knots more wind than where we were, and there are no obstructions behind you to interfere with the wind flow. We had left it a bit too long, the wind had dropped to nothing 10 minutes before we got back to the rigs so both kites were in the water. 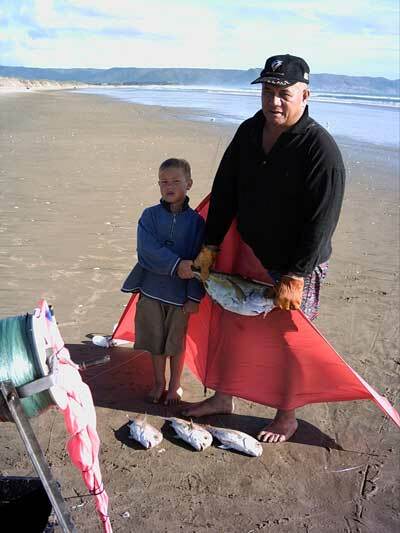 This happens frequently at Mokau because everyone goes home for breakfast once their kite rigs are set out and fishing, they simply bury the reel spike deep in the sand and leave the gear unattended. The downed kites were recovered easily despite the fact that neither had a float or safety trace connected, (not recommenced). Neither rig had cleared the muddy zone so no snapper were caught, but they still managed to catch a feed of gurnard and red cod. The skate in the pic below is an unusual catch for this area. Above : Jeff Litton, Heidi Preston, Steve McEwen and Jeff Preston with lunch. Rob and I were going to stay an extra night on the off chance the weather would bring fresher winds today but decided against it. We checked all the weather sites on Heidi's computer and although Buoyweather forecast 11 to 15 knot easterlies for Friday, we thought it would be the same difficult conditions. We thought this because it appeared the high pressure system was stationary on every other forecast we checked. Once again Buoyweather got it right and a gleeful Geoff Preston rang this morning to report he had just caught two snapper of 3.1 and 2.1kg while another kitefisher Mark Ashcroft had caught two snapper of 6.2 and 5.3kg. The winds were stronger and both Geoff and Mark managed sets of around 2000 metres offshore. Still that's fishing! When arrived at Otaramarakau on the 18/06/06 there was not enough wind to fly the kites so we used the rods, the baits got crabbed, so we had some lunch. Just as we were about to pack the gear up the wind swung around and freshened. We quickly got the kite flying and the 20 hooks on the kite longline rig baited up with mostly mullet. When the gear got out to 500 metres the kite went into a dive and took a swim. We left the set for about 40 minutes and landed two nice gurnard and three kahawai for our efforts. Kite fishing in a similar area a couple weeks earlier we landed six snapper to 4kg and six kahawai on fresh kahawai and mullet baits. Some time ago I recieved a fantastic report from the chap in the photo regarding a kite and kontiki fishing holiday. He had carefully reported on every set done over a long series of fishing trips using the new Berkley artificial baits and a variety of fresh and frozen baits. The comparisons he had made were valuable information which would be of great interest to our readers. Unfortunately I have lost the email fishing report that goes with the great series of kite and kontiki photos he sent in. I recall the over 100 fish were taken during the holiday. Hopefully, he still gets this newsletter and will get in touch with us. If you know him please let him know we would like the email re-sent to us. We still have all the photos. 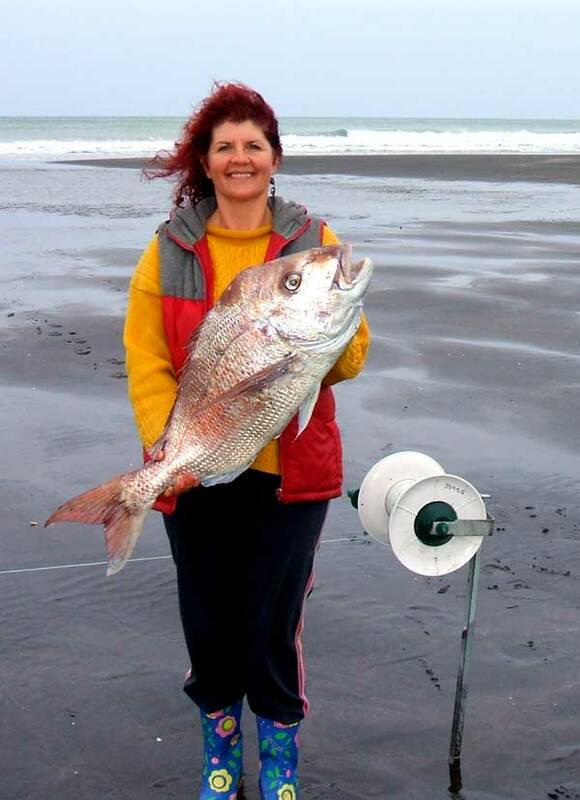 Snapper are still being caught at the top end of Muriwai Beach and north easterlies are predicted for Saturday and Sunday. Check Buoyweather below for details.